In case you were wondering, the music usually presented here has been pre-empted by the Super Bowl. We come to you from Green Bay, Wisconsin, where your correspondent has been a bit busy lately. This has been a special season in Green Bay, and only partly because of the Green Bay Packers’ run to Super Bowl XLV. In November, legendary NFL Films composer Sam Spence visited Green Bay for a week, working with music students and conducting a program of his music. Spence, much like the Packers and Lambeau Field, is a national treasure. But did you know that orchestras can’t buy the scores of his NFL Films music? NFL Films owns and publishes the music. When Spence makes an appearance — and he doesn’t make many — he brings them along with NFL Films’ blessings. So why not bring some Sam Spence to your Super Bowl party? 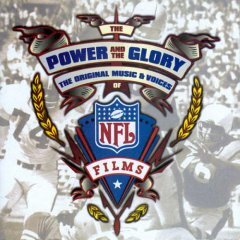 All composed by Sam Spence, from “The Power and the Glory: The Original Music and Voices of NFL Films,” 1998. There aren’t any session notes for these compositions, but most likely date to the late ’60s or early ’70s. Play some Sam Spence before the game and you will be stoked for action. Be sure to get your pregame marching orders from Bart Starr, too. Cheers are due you and all Packer fans! We in New England, bow to your championship and allow you to bask in deserved glory. All Hail to Bart and Spence!